Now there is a better way to keep your holiday lights protected from the weather, with the new Twist and Seal family of products. No more need to fumble around with duct tape, electrical tape, or plastic bags out in the cold, damp weather that we experience each December. With Twist and Seal cord connections, you do not have to worry about the effects of rain, ice, and melting snow on your holiday lights. The patented, clamshell design, folds over top of electrical connections to keep moisture out. It’s a simple design, but it works! So much so, that Twist and Seal received the award for the most innovative product for 2014 at that National Hardware Convention! Last year, there was only one option – the Original. This size is great for small and large electrical connections between one cord and another. The Original Twist and Seal will accommodate large outdoor extension cords as well as thinner light sets and indoor cords. New for 2014, are the Twist and Seal Mini as well as the Cord Dome. 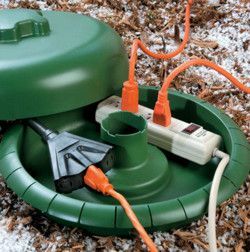 The cord dome measures 14″ in diameter and is great for anywhere you have more than one connection meeting up. This is perfect for 3-1 adapters and even power strips! Even better yet, all Twist and Seal products are made in the USA and backed by a 3-year warranty. Not only does Twist and Seal cord connections help you during the holidays, they are also great for outdoor power equipment used all year long, such as generators, pond pumps, or patio string lights.